By Kevin Lindegaard, MD Crops for Energy and WHA Director. 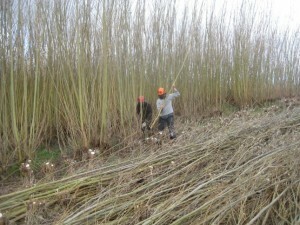 Willow is one of the fastest growing trees and produces a lot of biomass in a short space of time. If you have a bit of land and you want to be self-sufficient in woodfuel, you can! What’s more, you can achieve this in around 4-5 years. With most trees, you are planting for future generations but with willow, you can personally benefit in next to no time. A large farm house or a small farm complex using 10,000 litres of oil per year (~100,000 kWh) for heating would require about 27 tonnes of woodfuel per annum. 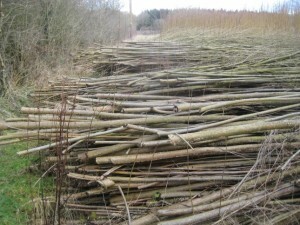 This could be produced by growing just 3 hectares of willow managed as short rotation coppice (SRC). Over the lifetime of a plantation (about 25 years), the cost of delivered fuel in most circumstances will come out at a lot less than 2p/kWh. This is based on realistic yields, high costs (due to the lack of economies of scale) and even takes into account lost income from other activities (e.g. growing food crops). At the moment fossil fuel prices are reasonably low (although on the rise again) but I doubt there are many people willing to bet that they will stay at the current level for the next 25 years. By planting willow you really can insulate yourself again future heating fuel price rises. SRC willow can grow into very chunky wood if grown at wider spacings over longer rotations (the stool on the right is 9 years old). So what’s the catch you may ask? Well, with the quick growth that willows achieve there are certain trade-offs. 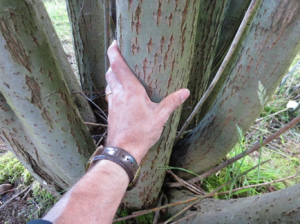 For instance, willows and their close relative poplars have the lowest density of all hardwoods. In fact, the density of the wood is lower than many softwoods. This has some implications. When you move willow, irrespective of it being in log or chip form, it will take more journeys as it will take up more space in a waggon. Similarly, you will need more space to store it. If covered space is at a premium you may seriously have to consider other options. Finally, it burns quickly. If you have a log boiler you will find yourself stocking the system more frequently. Can you see yourself doing that for 25 years? 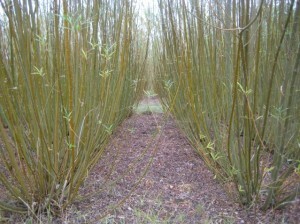 By growing willow as a coppice, you will produce many stems. This means that the ratio of bark to wood is higher than trees grown as a single stem. As a result of this high bark content, burning willow wood will result in a lot more ash – perhaps as much as 3-4 times as much. 27 tonnes of willow chip with a 2% ash content will mean the disposal of over half a tonne of ash per year! You need to have a plan for dealing with this, be it returning it to the land or disposing of it some other way. Any contamination of the fuel e.g. 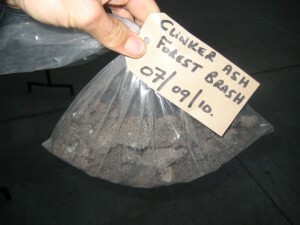 with soil or if the crop is harvested in leaf or has a high weed incidence will mean there is a greater tendency for the ash to melt and produce clinkers (glasslike deposits). Your chosen boiler needs to be able to deal with these. 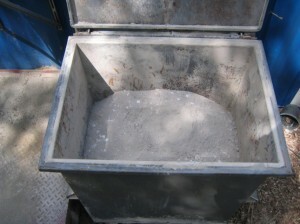 You must be prepared to deal with more ash and your boiler needs to be able to handle clinker formation when using SRC and forestry residues. It is possible to reduce the ash content of willow. Planting at wider spacings (6,000 plants per hectare rather than 15,000/ha) and growing over longer rotations (five years rather than three) will mean that much larger shoots are produced. This is definitely an option on the small scale as in this situation you are committing yourself to harvesting manually with chainsaws. This might sound onerous but you have to remember that in order to produce a seamless supply of fuel you would harvest a proportion each year. If planning a 5-year rotation you would harvest 20% of your plot each year from year 5. If you have planted 3 hectares then that’s just 0.6 hectares. It’s not a massive job to cut the crop. Extraction and processing are more labour intensive but still comparatively cheap compared to bought in wood chip. You’d be surprised how many people there are out there prepared to use their small plots of land in this way. We sell lots of willow cuttings to such die hards. 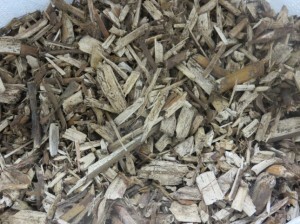 The quality of willow wood chip can be improved by harvesting over longer periods and with different machinery. The image on the left is dirtier wood chip produced from a modified forage harvester after 3 years. The image on the right shows cleaner woodchip produced from chipping 4 year willow that had been harvested in the rod form. Manually harvesting, extraction and chipping of willow may seem onerous but is less time consuming or costly than you might think. However, probably most landowners who seek to plant willow will be aiming to do it commercially and that means machine harvesting. The majority of harvesting systems in the UK are modified forage harvesters that produce chips as they cut. 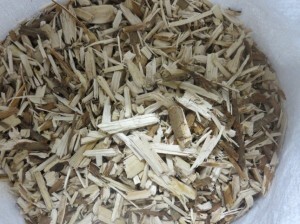 Willow chip can be 50-60% moisture content when freshly cut. The fibrous nature of willow means that it is very quick drying (down to 30% moisture content in 3-6 months) but a badly formed heap, situated outside can turn to compost quickly. Woodchip drying floors are now very common and with willow, they are truly justifiable depending on the scale of operation. However, it is possible to dry willow without direct heat. A well-ventilated shed can also do the trick. You can see case studies of Gurteen College and Berkshire College of Agriculture for details of both options. A quick glance at the table below will show that willow chip has higher concentrations of many elements compared to trees from round wood thinnings. As a result willow chip is a middle ground between this superior woodfuel and forestry residues or arboricultural arisings. This makes the choice of boiler really important. You need a boiler that can deal with the stringy nature of the fuel (many now come with rotary choppers in their augers), deal with ash melting (and clinker formation) and high ash production and have a robust chamber that can cope with the higher concentrations of chlorine and sulphur. There are many multi-fuel boilers capable of doing the job on the market. If I were buying a boiler I’d do some homework on the internet and then try and talk to people with boilers using willow as a fuel. This should lead you in the right direction to the correct boiler. Of course, a truly independent consultant can also help you come to a decision. Table 1: Fuel characteristics of SRC compared to other sources of woodfuel (Adapted from Willow as Fuel, Paulrud, 2015 and British Standards, 2010). Willows are great as a biofilter and take up nitrogen and other soil contaminants with gusto. If you are claiming for funds from the Renewable Heat Incentive (RHI) you will need an emissions certificate for your boiler when using SRC chip showing that the boiler can meet emissions for oxides of nitrogen (NOx) and particulates. If the nitrogen content of the willow chip is too high it might be necessary to blend it with other sources or add abatement equipment to the flue system. All in all, willow can provide a cheap and plentiful source of woodfuel. All that is needed to make a successful project is an understanding of the characteristics of the fuel and making the right choices of boiler and how to grow and process the crop. Note: The Board of Directors of the WHA will each month publish a blog on topics related to the biomass heating industry. The views expressed in this blog post are those of the author(s) and do not necessarily reflect the views or policies of the WHA/REA.